Unboxing and Review of the Fizz yoyo. The Fizz Yoyo: Unboxing and Review Yoyo TrickThe Fizz is the most versatile yoyo for beginners that we have ever carried. So, if you have never yoyoed before, the Fizz makes learning to yoyo easier than ever. 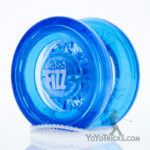 This is the Fizz yoyo and as you can see, it comes in our YoYoTricks.com small box. Like all yoyos that come in the small box, it is a lot easier to get out if you remove it from the bottom. You will notice when you take the yoyo out of the package that on the inside of the package there is some extra string in there. So first thing, before I talk too much about the yoyo, just let me show you how the string goes on. It goes on the same way it goes on other yoyos. So there is nothing special about that. You know like all yoyo string, you have got two ends. This one has the loop for your finger. Then this end goes on the yoyo. You are just going to untwist that, open it up, and you want to put it on the yoyo while the yoyo is already screwed together. You never want to put a string onto a yoyo while the yoyo is taken apart, because the string could slide between the bearing and the yoyo, and that will cut the string. So just used to putting the yoyo together first and then putting the string on. That will keep your yoyo working properly. Now we are really, really excited about the Fizz because we feel like it is the most versatile beginner yoyo that we have ever carried. Now, in saying that, you might not be exactly sure what I mean by that. So the first thing that I want to talk about is, what do we mean by saying that it is a beginner yoyo? Well, when we are talking about beginner yoyos, what we mean are yoyos that have specific features that make it easier for brand new players to learn the basics. Specifically, throwing the yoyo down, getting it back up, and then the first couple of tricks you learn after that. Now, a lot of yoyoers, when they talk about a beginner yoyo, what they are really thinking about is yoyos that are less expensive, or sometimes they mean any yoyo that plays responsive. We mean something a little more specific than that. We are talking about a yoyo that specifically has features to make learning the basics as easy as possible. So with the Fizz, the feature that is has that we feel like makes it qualify for that is if you look on the inside of the yoyo, as I am turning it you may notice that there is these little teeth on the inside. That makes it grip the string a lot easier which makes it easier to wind up, makes it easier to pull the yoyo back up, even when it is spinning slowly. And that can just help so much if this is your first yoyo because just learning how to throw the yoyo and get it back up, that can be pretty tricky. So, when we say that this a versatile beginner yoyo, what we are specifically talking about is the shape of the yoyo and the way that it plays. So I am going to bring in a couple of other yoyos, just to give you a point of comparison. 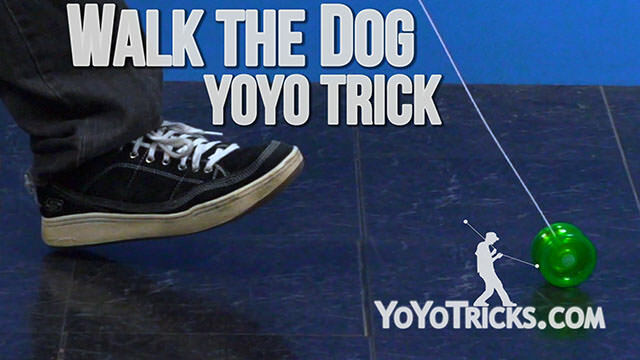 We have a trick list that we recommend players use called the First 50 Yoyo Trick List. And along with that, we have a pack that we call the First 50 Yoyo Tricks Pack, and that includes these two yoyos: The Sage and the Oracle. You can see that these yoyos kind of go together, they look a little bit similar, but then when you turn them on their side, you can see that they are extremely different. The Sage is really wide which makes it really good for tricks where you land the yoyo on the string. 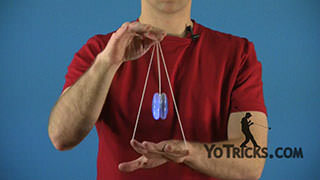 You can see that the entire width of the yoyo, if you were to start to land the yoyo onto the string, no matter where the string touches the yoyo, it will force the string into the center. That is one of the things that makes it good for those. The Oracle is just the opposite. It has really, really high walls here. That makes it really good for looping style tricks. 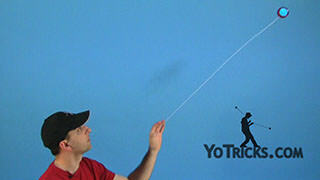 So, as yoyo tricks have become more difficult, yoyos have become more specialized, which allows you to go further. If you are a new player, what we like about the Fizz is that if is right in between these two yoyos. You can see that it has got a flared shape so that if you try to land the yoyo on the string, it will always force the string into the center, no matter where you hit it onto the yoyo, just like the Sage. But its inner walls are really high, so it is actually pretty good at learning the basics of looping, like the Oracle. Now as you can see, because it has got high walls, it is not like the Sage in this one respect, that the Sage, the inner wall is really low, which actually makes it better for string tricks. You can see the Sage is a little bit wider which makes it good for string tricks. The Oracle is a little bit more narrow which makes it better for looping tricks. So when you get into more advanced tricks, it is better to get specialized yoyos. But when you are just getting started, it is nice to have a yoyo that can bring you into the basics of all the different tricks that you are going to be learning as a new player. That is what the Fizz is. Now, everything from the ground up has been designed into the Fizz to make it as easy for beginners as possible. So the first thing is, it is made out of polycarbonate, which is probably the most durable plastic that yoyos are made out of these days. We have been selling the Fizz for a little while and we have not had customers experience problems with the yoyo breaking, which is really awesome for a beginner yoyo because beginners have a greater tendency to really slam the yoyo into the ground. So it seems like this has really held up well so far for the customers who have used it. Now the other thing, like all the yoyos that we have that have ball bearings, the Fizz yoyo can come apart. That makes it really nice if you get knots in the string that are inside the yoyo. You can just take the yoyo apart, remove the string, and then of course put the yoyo back together before you put the string back on. Now the first thing that I had mentioned in this video are these teeth that are on the inside of the yoyo right here. The way that these work, and the reason that they are so nice for beginners is because they actually get pushed into the yoyo a little bit as the yoyo is spinning. So as the yoyo spins, those teeth kind of move out of the way to allow the yoyo to spin and sleep freely. But then when you want to pull the yoyo back up, it is almost like they just pop right back into place and they grip onto the string and bring the yoyo back up quickly. Now, this is not the only yoyo to use this technology. But we really like the implementation in the Fizz. If you look really closely, you may actually just have to kind of feel it for yourself, but there actually these teeth are a little bit rounded. The nice thing about that is that it allows the yoyo to sleep really easily, even when the yoyo is on the string. Some other yoyos that use this same technology, you have to open the gap up a little bit to get them to play well on the string. But the Fizz, because the teeth are rounded, they do not interfere so much on your string tricks. So you will actually get a really nice play experience. I will show you that in a little bit with how it plays on the string, which will allow you to get into the basics of string tricks. The other thing that the rounded teeth do for you is, it is not as loud as other yoyos that use this technology. 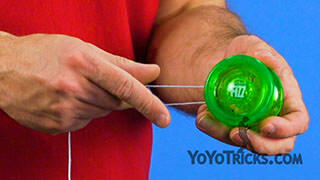 So, that is why we call it the Fizz, it does make a different sound that most yoyos, but it kind of a nice quiet sound. I think that you will see that when I am using this yoyo, it is actually a lot more pleasant that some other yoyos that use that technology, which, again, is just one more thing is has got going for it. When you look at the rest of the yoyo, you will see that there is no spacers, the only thing on the inside is this bearing. The nice thing about that is when you do have to take the yoyo apart to get out a knot, there is nothing to lose. Again, a lot of times, new players get yoyos that have spacers or things like that. Those things can get lost and then the yoyo will need to be replaced. So you do not have to deal with that. But the other thing, the bearing on this yoyo, it actually is attached, it has been press fit right onto this bolt. So even the bearing will not fall out of this yoyo, which, again, is just one more thing you do not have to think about. This yoyo is going to keep working for you. Now, like any yoyo, the string will eventually need to be replaced. So, if you get the pack that we have with the Fizz, that is going to come with extra strings. That will get you up and playing again in no time. Now, the one last thing that I want to point out about the Fizz is it does have a ball bearing, and we mention in several of our videos that any yoyo with a ball bearing, eventually that bearing is going to need to be lubricated. So again, to talk about the Oracle and the Sage, we sell Thick Yoyo Lube that goes with these yoyos. Every now and then, you will need to put a drop of thick lube into the bearing to keep it playing as responsive as you want. Now the Fizz is different because it has got these teeth, the teeth allow it to play as responsive as you want, even without thick lube. What we did with this yoyo instead is we pre-lubed the bearing with Thin Yoyo Lube, which allows the bearing to spin really freely. So you get long sleep times out of it. But the Thin Lube lasts a really really long time. So our expectation is that by the time you have learned all the basics and you are ready to upgrade to more specialized yoyos, you still will not need to lube that bearing again. Now, you always could get thin lube and put it into the bearing in this yoyo if you just wanted to be safe. But we would not recommend lubing it more than, even once a month. But we really feel like, this yoyo is pretty much good to go. You just need to change the strings as they wear out. And that is all that you need to do to maintain this yoyo. So, between the durable plastic and the implementation of those teeth on the inside of the yoyo, and just the way it plays overall, we are super happy to recommend this yoyo. We feel like this will really give you a leg up, especially if you are just getting started and you are not sure you are going to be good at learning the tricks. So let us take a look at how it performs all these different tricks we have been talking about. Like we were saying for new players, one of the things that is really nice about the Fizz is that those teeth on the inside grip onto the string when you pull it up. Practically speaking, what this means is that the yoyo does not have to be spinning all that quickly for you to get the yoyo to come all the way back to your hand. It is really really nice when you are just getting started because your throw is not going to be as powerful, and you just will not have really good technique. So to have a yoyo that responds easier means that you are going to be winding it up less and there is just going to be fewer problems in general. Now, once you are ready to start working on tricks, because those teeth are rounded, it is going to sleep really nicely. So you can get a good sleeper for tricks like Walk the Dog. 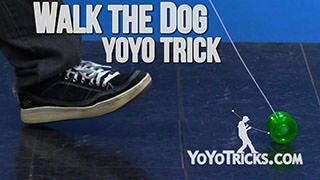 When you start to learn tricks like Rock the Baby, you are going to have plenty of spin time to learn these tricks and get the yoyo back to your hand. Then when you want to move up to string tricks, the nice thing about this design is that it does not interfere. Those teeth do not interfere with the yoyo while it is on the string. 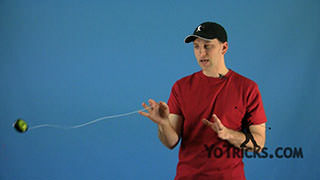 So you can actually do a lot of different types of string tricks even though it is a responsive yoyo. On top of that, because the shape is a little bit more like a looping yoyo as well, you can also practice all of your looping tricks with the same yoyo. So you can work on your normal loops. You can work on Hop the Fence, you can even get into some more advanced loops like Shoot the Moon. Because it has got that flared shape, it is actually going to be a little bit easier to learn that then a lot of yoyos. And, because it is the same yoyo you have been using, you can work on your loops, and then immediately you can can work on your string tricks again without switching yoyos or adjusting the yoyo at all. So you put all that versatility into one yoyo, and it is really really low maintenance, the only thing that you will ever have to do with this yoyo is change the string. It is made out of that super durable polycarbonate plastic. And it is a pretty low price point. 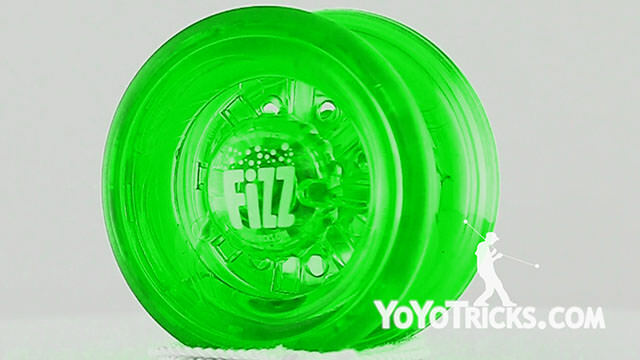 So we feel like for all those different reasons, we could not be happier to recommend to absolutely new players, the Fizz yoyo.